In the battle against ISIS, the U.S. just scored perhaps its biggest symbolic victory yet. According to Col. Steven Warren, a spokesman for the U.S.–led coalition against the Islamic State, the man widely known as the Umpire of ISIS was likely killed late last week in a targeted drone strike. A powerful public figure in the militant group, the Umpire of ISIS was a frequent and chilling presence in its brutal propaganda videos, stooping silently in the background in full umpire gear as hostages were executed. U.S. military intelligence officials say they were alerted to the Umpire of ISIS’ location by a resident of the ISIS-occupied city of Raqqa who saw the famed militant standing motionlessly in the courtyard of a rumored jihadi safehouse for eight uninterrupted hours. A U.S. senior commander authorized a drone strike shortly thereafter, and the next morning, a surveillance satellite was able to procure a distinct image of a mangled umpire mask amidst the rubble, all but confirming that the U.S. Hellfire missiles had succeeded in hitting their target. 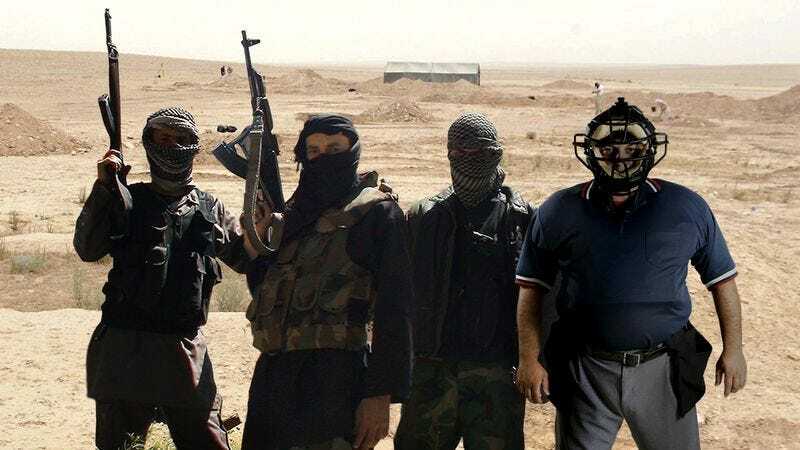 While the Umpire may have only been one ISIS member out of tens of thousands, he was a prominent symbol of the group’s public image, and his death will hopefully serve as a crushing blow to the terrorist group’s morale.